Catrina and I had the privilege over the summer of getting to spend some time with the author, speaker and broadcaster Jeff Lucas, and his delightful wife Kay. Jeff was a speaker at the One Event we went to, and did a talk on the life Samson which was not only highly engaging, but also had a very stong personal challenge, and was full of insights on how in many ways the struggles of Samson's life are the struggle every one of us lives with. The struggles with our brokenness, the struggle to deal with past hurts and failures, the struggle to overcome sin and temptation, the struggle to find our identity and the struggle to live out God's call on our lives. This book is an expanded version of that talk. As a book it really spoke to me, and ministered to me. Especially the middle chapters on how God works through the mess and brokenness in our lives. 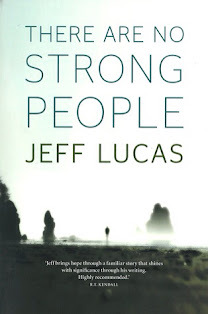 I think it would be a great book for anyone going through a tough season of life, or anyone you may know who is wondering where God is in all that is happening to them. Jeff is going to be speaking at Greyfriars Church in Reading on the 29th November, as part of his Seriously Funny Tour with Adrian Plass. If you're free then I'd thoroughly recommend getting along to hear him.